In this time-travelling romp, Andrew Fish brings a new slant to the classic legend. Erasmus Hobart is the perfect new adventurer for fans of Douglas Adams and Terry Pratchett. Robin Hood was a crook! But was he as good a crook as the legends suggest? That’s what Erasmus Hobart – school teacher, history fanatic, time-traveller – wants to find out. In this, his first adventure, Erasmus takes his time-travelling privy back to mediaeval Nottingham in his quest for knowledge. But with homicidal knights, amorous female outlaws and mischievous squirrels complicating his investigation, will he uncover the truth in time to get back and mark 4A’s history homework? I’ll be the first to admit that I know pretty much zilcho about the legend of Robin Hood and his band of merry men. What I do know is that they weren’t a bunch of foxes and other such forest animals running around and having a good time conning the sheriff out of the taxes. But that’s about where my knowledge ends. Pretty sad, really. 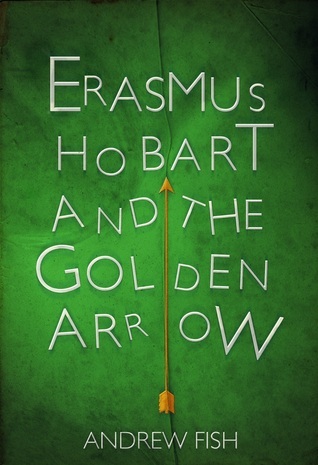 Erasmus Hobart and the Golden Arrow was a brilliant book in many respects—I learned more about the legend of Robin Hood than I originally knew before reading and the book made a very important point—history is the perception of those who write it. Think about it… how do we know Robin Hood really stole from the rich and gave to the poor? We don’t… it’s someone else’s legend. And that’s exactly the subject matter in Fish’s novel. Erasmus Hobart (I freaking love that name) goes back in time via a kitted out wooden privy (think Tardis!) to see what Robin Hood was really like. And boy is Erasmus shocked at what he finds. I won’t say much more than that because I’m not one to publish spoilers, suffice to say the truth Erasmus finds is a lot more interesting than legend. The book itself is quite clever and easy to ready, even if it’s something that’s been done before—and for 99p on Kindle you really can’t say no! I enjoyed the romp through Sherwood Forest with Erasmus and look forward to seeing what Fish has in store next for the kooky time travelling teacher. You can count me in as a fan if it branches into a series! Next ›What an exciting week! !